We have had a room in our house that we have called the Nursery since we moved in; it’s the cutest little room and was just waiting for a new little one to move in. Now it’s home to our little mancub and we had so much fun planning, designing, and building a space that he can grow, learn, and play in. Life is super busy with a newborn so while our little one was napping, I “quietly” snapped a few photos of his space to share with you… and a few of his really peaceful face (which didn’t last for long… que the next couple of hours of inconsolable crying… him and me). So cute Emily! I love the book nook and all the amazing wall art. Great job! Shannon, Thank you so much! That book nook is my favorite too. It was always what I had in mind when I laid eyes on that room! His room is so adorable. You did awesome. And he is too cute! Thank you! 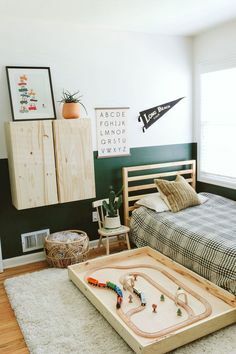 Your picture is one of my favorite things about the room too and matches those wooden animal dolls perfectly! Thank you again for your talent and gift!